Which animal species are the most likely carriers of future emerging diseases? New research led by Barbara Han (also involving JP Schmidt, Sarah Bowden, and John Drake) used boosted regression trees to look at ecological traits associated with a propensity to carry diseases. 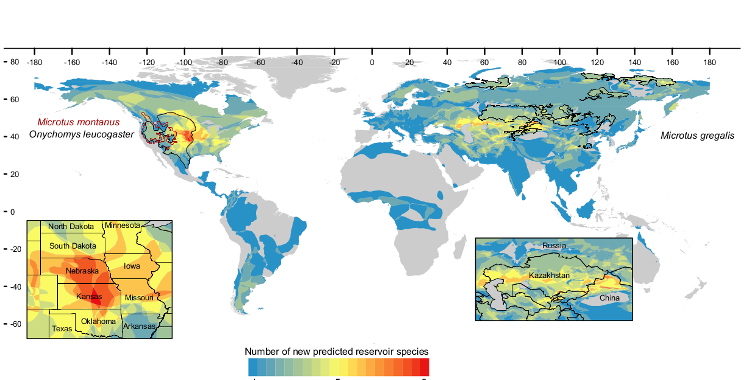 More than 50 potential reservoir species were identified, concentrated in temperate regions of North America and Asia. Interestingly, the species predicted most likely to host novel pathogens are those with a fast life cycle, consistent with the pace-of-life hypothesis. Complete results available on the PNAS website. Press releases by UGA and Cary. Coverage by Science, Nature, and the Economist. Han, B., J.P. Schmidt, S.E. Bowden, & J.M. Drake. Rodent reservoirs of future zoonotic diseases. PNAS (in press). Research supported by NIH National Research Service Award Postdoctoral Research Fellowship to B Han.